The day before Christmas the new drive-way through our RHQ buiding was finished. 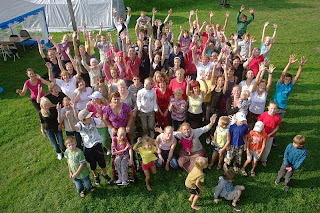 What are your brightest memories from your work, ministering to the people of Latvia? The goal of all our work has been and still is to take care of the person holis­tically, providing spiritual, material and practical help, as well as stressing that all people are equally valuable. Among the most significant memories is the meeting in 1998, when about 25 deaf and blind, visually handicapped young people were enrolled as Salvation Army soldiers. I also enjoyed watching the deaf young people sing a song with music. The meeting in1999, when10 junior soldiers were enrolled. We always treasured the special Bible moments in vari­ous camps, putting Jesus, God’s love and care in the centre. I remember it was a challenge to give deaf young people the possibility to achieve a European Computer Licence, to show that deaf people in Latvia can achieve as much as deaf people in Sweden. It has always been moving to see severely handicapped young people take their first stumbling steps and to hear a word from someone who never talked before. What other challenges did you have to face? There were lots of them. We have tried to change people’s attitudes and to support and help the staff via knowledge transmission. We have attempted to influence the authorities, to increase people’s self-confidence, showing them God’s love and care. We tried to give spiritual, material and practical help. Cooperation with authorities and organizations in Sweden as well as in Latvia has enabled the implementation of big social responsibilities. Not only a great number of humanitarian aid shipments but also huge transmissions of knowl­edge. Please, tell an example, when within the framework of this work, a person’s life has been changed. During a visit at the School for Deaf people in Riga 1993 I met Sergejs Versinins, 17 years old. He had two handicaps. Besides being deaf he was also limping. He did not want to live. He did not have any relatives. Sergejs later came with the deaf children to Sweden for summer camp. At Huddinge Hospital he received a hearing aid. Every summer after that for eleven years he came to spend the summer in Sweden and have fellowship with deaf Swedes. What dreams has God put in your heart for this work in the future? The love of God is revealed to us through Jesus Christ. Jesus calls us to go out and make all people his disciples. This means that I as a Christian and a fellow creature have a great responsibility. Out mission is still to proclaim the Gospel about Jesus Christ and without discrimination meet human needs in his name. My dream and my prayer regard visiting programs. There are names and addresses on many hundreds of young peo­ple who have attended our camps. They live all over Latvia. My wish today is that they would be visited by someone from the Salvation Army, who can help them to grow in their faith and show them God’s love. My vision for the future is that there would be a meeting point, a place where handicapped people could listen to the Gospel about Jesus Christ and get a personal faith in Him. Some hundred years ago there was a revival movement in Sweden called the "Readers". They were called so because they were reading the Bible. Not only reading, but reading and reading and reading. I saw in an encyclopedia a definition of the "Readers". They were described as people “reading the Bible without interpretation of an ordained minister”. They did not look for explanations in Bible Commentaries or from priests. They were just reading and expecting God to speak to their hearts directly. I think we need such a revival again. When people really take time to read the Bible slowly and listen. I think we have very much forgotten the meaning of living slowly. Everything must happen in a high tempo, fast food, fast living, fast everything. But God does not always speak in a rush. It takes time to be so low speed inside, that you can distinguish His voice among all other voices demanding your attention. I hope the Reader-revival will come back. A time when we understand that life does not get better the faster you run through it. A time when we rediscover the value of taking time to read the Bible. Not only reading, but reading, and reading, and reading, and listening…. The past week has been dominated by Christmas parties. Tuesday we travelled to Skangal to take part at the Children Home Christmas party. We experienced a drama and a visit by Father Christmas. According Latvian traditions each child must recite a poem before recieving Christmas gifts. Some of the children were of course very nervous performing in front of their friends and the crowd. On our way to Skangal we stopped in the neighbour village of Sarkani to look at the "Children´s House" we are building in the village. Here is a link if you want to see the work with the house. The next day we were at the Christmas party at Patverums, our after school program in Riga. At Patverums we saw both dancing and drama. Thursday we drove down to Iecava for the Christmas service at the corps. The builders had worked all night to get the hall finished in time for the service. It is a completely new hall on the upper floor of the corps building. The same day, the day before Christmas Eve, the new driveway through our house in Riga was opened. Two building projects were ready the same day! I wish you a blessed week. The last week of 2010..
"Every Christmas we are reminded of the innkeeper who turned Mary and Joseph and their baby away. We do not know his name, but we do know he tried sincerely to make amends by at least offering space with the animals. Luke’s Gospel records ‘there was no room for them in the inn’ (Luke 2:7 New International Version). The main accommodation was packed out, due to the national census under which all citizens were required to return to their places of origin in order to be registered. ‘Have you any room for Jesus?’ asks the old gospel hymn. Poets and hymn-writers down through the years have found in this sacred birth narrative much to inspire them. They picture the holy family outside the inn, seeking admission, and find in that image a powerful metaphor applicable to us all still today. Another writer urges us to offer Christ ‘the best of rooms’, with the final words of the song affirming softly that ‘the best of rooms’ is ‘the heart’." For the second year in a row we have received permission to have our Christmas Kettle in the old town in Riga. In many other cities in Latvia the Salvation Army Kettles are also present. This clip is from Riga last year. Personal comments from my view-point on life. As I wrote in my "Mid-week review" we are now in the time for Christmas parties. Last Friday it was time for another party. This time the party was for the families our social workers meet in their visiting ministry among families living under poor conditions in Riga (see picture above). Almost 150 people came to Riga 1st corps to have a nice Christmas dinner. In the program there was also music, christmas songs and a sermon. The two social workers, Aldona and Anita, were responsible for the party. One of them was speaking in Latvian, and the other translated into russian. 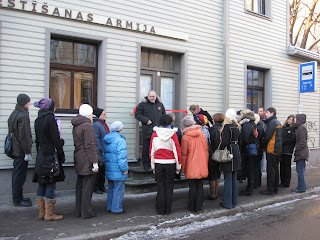 Lat Friday we also put out our christmas kettle in the Old Town of Riga. We have received permission to be there six days. We do not expect very much financial support, but it is a great opportunity for us to come out and talk with people and invite them to our two Riga corps. Today it is Sunday and Ruth and myself are having an early start to drive 3-4 hours to Liepaja on the west-coast to have the Sunday service at 11.00. Photo right: Bertil Rodin at the gate of Skangali. 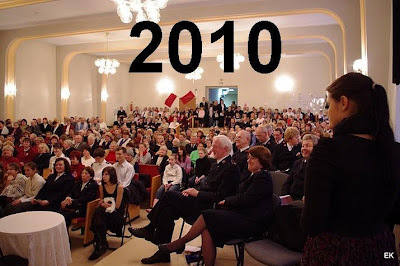 In connection with the twenty years anniversary of the re-start of the Salvation Army work in Latvia after the occupation, a special edition of "Kara Sauciens" (War Cry) was published. Some of the articles from that edition will be published here. 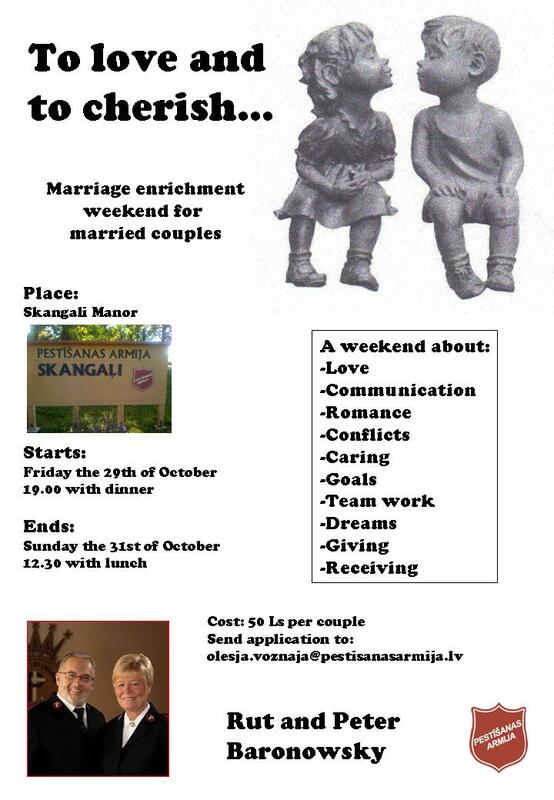 This one is about two of the pioneers restarting the work in Latvia. 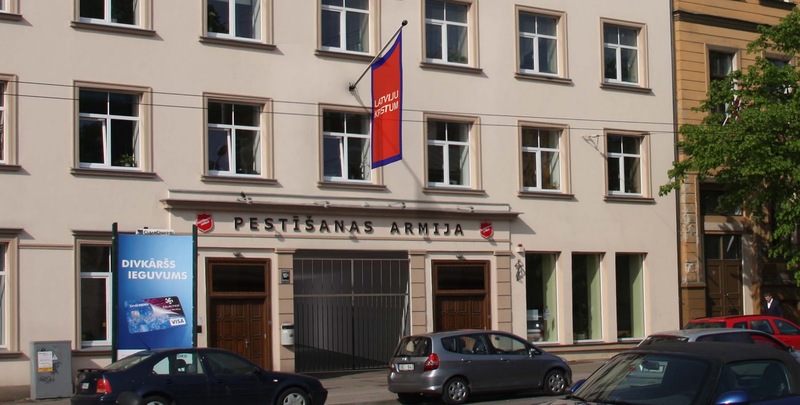 The Salvation Army’s history in Latvia (and the Baltics). ““..when the Army once again commenced work in Latvia in 1990, Ruth felt that she ought to be there. 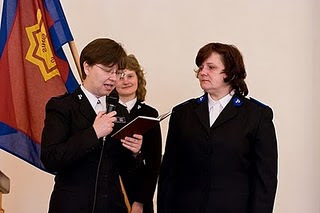 She started by arrang­ing for relief shipments while she was the leader for the corps in Lulea and by August 1992 was on location in Latvia to participate in the pioneer work. In the Finnish Krigsropet #12/2000 Raija Lahteinen describes Captain Ruth Hansen’s early days in Iecava. To start with there was no available meeting place, so contacts with people were made in the open market place by serving coffee, distributing Bible tracts and singing a few refrains in Latvian. After six weeks Ruth Hansen found a suitable meeting place where people could be invited and a regular ministry was established. Relief shipments came from Norway and Sweden, which meant that social assistance could be given. After some time work was also established in Bauska, a larger community than Iecava, but that did not mean that the work in Iecava ceased” (p.114). “God even uses fleas!” Ruth Hansen tells the story of how she was attacked by vermin and finally had to seek the help of a dermatologist in Bauska. That contact led to the doctor, Ruta Stelmaka, becoming a Salvationist. During these many years she has served as translator for the corps officer and all the visitors from other coun­tries. Ruta Stelmaka also set up a small clinic in the building in which the corps rents space, receiving people who could not afford to visit a doctor.” (p.115). “When it comes to the Skangal project there are many who have worked on it together, but the passion driving it all is Bertil Rodin in Stockholm. He was the one who met Claës Palme and Mårten Palme during the flight between Stockholm and Riga, which has been mentioned earlier. That became a meeting with consequenc­es.” (p.196). “Anyone who is passionate has difficulty going into a quiet life as a retiree and so it was natural for Bertil Rodin to involve himself in the work for Latvia, and especially Skangal. Its chapter is finalized for this book, but every day new excerpts are being written into the Army history and especially into the hearts and minds of young Latvian children and young people. Skangal gives witness to the mutual understanding and good will and the indomitable faith in everyone’s potential that burns within the heart of the passionate. The Latvian Republic honoured Bertil Rodin for his contributions, when President Vaira Vike-Freiberga pre­sented him with the Latvian Three Star Order on May 4 2001.” (p.197). 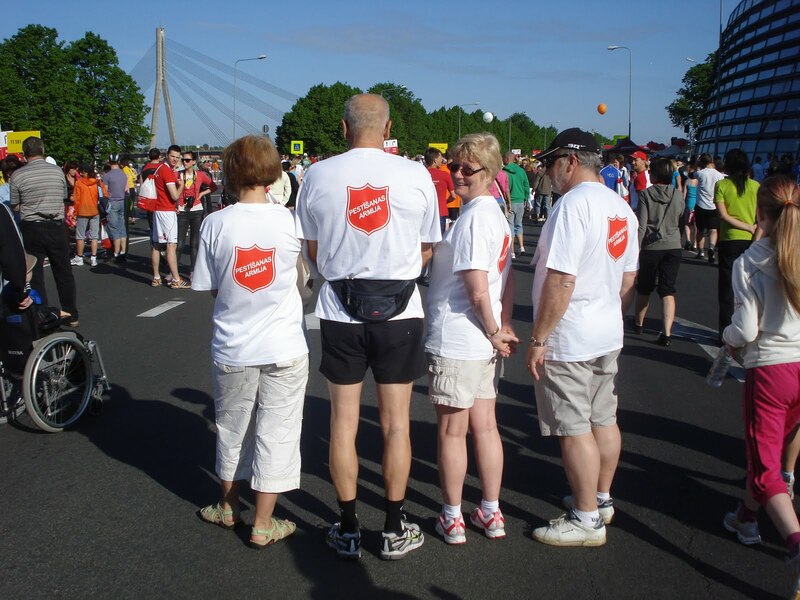 More about the beginnings and history of The Salvation Army in the Baltics can be found in “Baltic Bridges” by S. Nilsson. Available in Swedish and English, to be translated into Latvian. The time for Christmas Parties is here! Yesterday was the first big party. It was the Christmas party for employees. 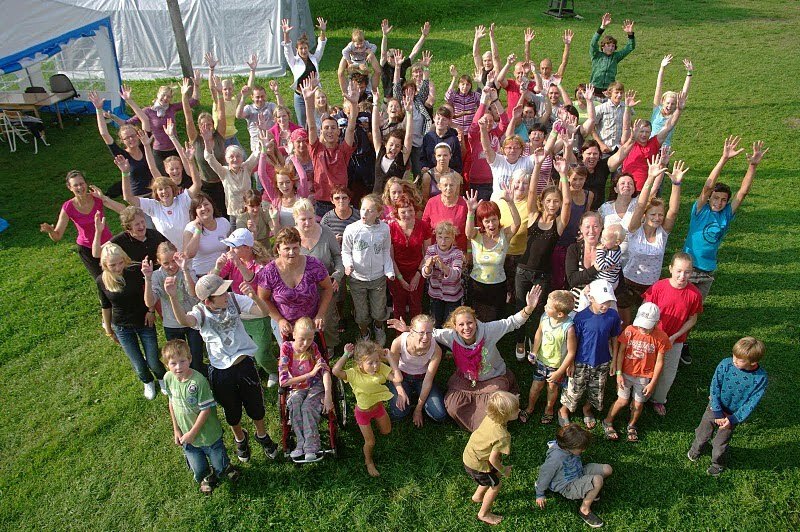 60-70 people were gathered from all over Latvia: from Liepaja in the west, Bauska in the south, Seda in the north and Daugavpils in the very southeast corner of Latvia. ...and below you can see the employees with a improvised choir, tamburine brigade and a dance. During the Christmas party a delivery from "Humanitarian aid" in Sweden arrived with 350 Christmas gifts to be handed out to children in the different corps in Latvia. In Latvia there is also a national christian radio, braodcasting non-stop day and night. Last Tuesday Ruth and myself were invited to make two programs. 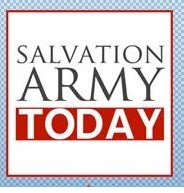 The first program is an interview about ourselves and the Salvation Army work in Latvia. The second program is about "Hope" and we were asked to speek from the first three verses in Isiah 61. Tomorrow is time for the next Christmas party. The families we visit in our outreach ministry are invited for a Christmas dinner. We expect a full Hall again. "In the beginning was Nothing, and Nothing created Everything. When Nothing decided to create Everything, she filled a tiny dot with Time, Chance, and Everything and had it expand. The expansion spread Everything into Everywhere carrying Time and Chance with it to keep it company. The three stretched out together leaving bits of themselves wherever they went. One of those places was the planet Earth." A great Christmas story from Sven Ljungholm. The media can be blamed, or credited, for inventing and providing the general public with many things, among them, new ‘buzzwords’. One such word first popped up on a TV comedy show a couple of years ago; re-gifting! It means rewrapping a present one didn't want and consequently, rewrapping it and re-gifting it to someone else, making certain of course, that one doesn’t mistakenly re-gift it to the original “giver”. The television program suggested that the genesis of the word stems from the ubiquities Christmas fruitcake. Their claim was in fact that only three fruitcakes were ever baked in the USA. The perception that fruitcakes exist in far greater numbers stems from the fact that they are never unwrapped from their colorful cellophane and devoured, they are simply re-gifted.. Even though the word re-gifting is relatively new, the practice is not. Re-gifting began with God, Mary and Joseph, on the first Christmas Eve. One won’t find the word re-gifting in Webster’s dictionary yet. However, both the Old and New Testament provide a definition of re-gifting and are replete with examples and exhortations. On that first Christmas Eve God gifted Himself to us in the form of His Son, gifting Himself as it were, "He hath given all things into the hands” of His creatures. His was a gift designed specifically for you and me, and to all. Do you remember when you first heard the name Jesus, and He became real to you? Perhaps for you, like me, one of the most powerful remembrances was the family Christmas Eve table. It was my SA officer grandparents reading the Christmas story at the table… and some years later my parents doing the same… always on Christmas Eve. Sixteen years ago I celebrated re-gifting at a rather unusual Christmas Eve table. It was in Moscow, Russia, and it served as a powerful reminder of what the consequences of re-gifting can be. I was privileged with other Christians to serve in Russia, immediately following Perestroika- they were busy, heady and often difficult times. One of my favorite monthly activities was leading the Sunday evening devotions at the USA Embassy, a gated community in the center of Moscow with high walls protecting it. A group of some 35-40 expats, Americans living in, or visiting Moscow, would meet to worship. Visitors were always found in our small assembly and one Sunday there were five USA military officers visiting our evening service. All five belonged to the Association of Christian Military Fellowship and had been active for several weeks in signing up Russian regiments. They were given opportunity to share the Gospel with large groups of military personnel, an unheard of witness opportunity in the history of the Soviet military. Hundreds and eventually thousands of Russian military personnel accepted Christ and joined the Russian branch of the association. Following the service at the Embassy we shared a burger and Coke and we spoke about how The Salvation Army could perhaps be helpful in their gaining access to the Russian Military Officer Academy. They had learned that one of my activities was lecturing weekly at the Academy and they were anxious to meet Russian military officers and cadets. We arranged to have dinner that week, and the date would be December 24. We met at a typical Russian restaurant. It was rowdy and I recall the rooms were smoke-filled, enough to sting one’s eyes…Vodka and champagne was flowing freely; the voices of the Russians loud as they sang and toasted each other. We heard their exuberance well before venturing inside. As we entered, dressed in USA military officer uniforms and two of us in Salvation Army uniforms, we must have been a very strange sight. Those in the restaurant raised their glasses and voices in welcoming us, and then returned to their merry making. 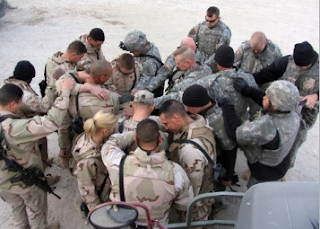 We were quickly seated at our Christmas table, ordered our meals and bowed in prayer… it was our Christ mass table, thousands of miles from our families who were celebrating their Christmas Eve overseas, at home. Our thoughts and conversation naturally turned to “family”. One of the USA military officers shared that he was born and raised in Chicago, and went on to say that he became a Christian as a young boy. A Salvation Army officer had come to his home on Christmas Eve delivering a parcel of food and toys to him and his siblings. His father, he explained, “had abandoned the family and they were living on welfare. After passing out the Christmas gifts the Salvation Army man asked my mother”, he said, “if he might be allowed to read the Christmas story- we sat at our kitchen table as he read… and then he asked me and my sisters if we’d like to have Jesus living in our hearts- we knelt there in our tiny kitchen, and he prayed with us- and Jesus has been my Lord ever since”. “So did my sister”, he exclaimed! I asked what year was that visit to your home, and he informed me that it was 1960. I asked him to describe the SA Officer who had visited his home and he shared, “he was tall, maybe in his late 30s, and he spoke English with an accent of some kind.” “Could it have been a Swedish accent”, I asked? And at that moment all of us at that Christmas table realized concurrently, as tears flowed freely, that the man who had brought the gift of Jesus to that young boy, 40 years earlier on a Christmas Eve was my father. The re-gifting of the story of the birth of Jesus, the love of God, to that young boy was the catalyst that was now bringing the name of Jesus to thousands of Russian military men and women, former atheists and agnostics. The Name above all other names was being re-gifted. Although the word re-gifting doesn’t exist officially, I did an internet search and was more than a little surprised at the number of websites committed to teaching re-gifting. And there are already rules of etiquette about re-gifting. There is one rule among several that I want to share….